Writing a speech isn't quite like anything else you may be called upon to do. It's performance, but it can't seem rehearsed. It delivers information, but it can't seem too formal. Creating a speech that is genuinely engaging and seems spontaneous and heartfelt to listeners can take quite a bit of skill, but the sooner you start learning, the sooner you will find your feet. Good speechwriting is always in demand and this is a skill you'll find it easy to put into practice. Suit the speaker - the speech must sound natural coming from the speaker (whether it's you or somebody else) and must fit their style of delivery. Keep points concise - attention easily drifts during a long-winded speech. Break down your writing into specific points and fit them into the longer structure in a logical sequence. Appeal to the emotions - even a formal academic speech can benefit from humour, whilst a speech about tragedy can be affecting without being sentimental. Make it feel relevant - focus on why the speaker is the person who should be saying this and why the audience are people who can benefit from listening. Make listeners feel good - if you have bad news to deliver, make them feel they can improve things; if you're urging hard work, focus on how much they can benefit from it and how capable you feel they are. Use active language - don't worry about trying to impress with long words; active verbs and punchy, energetic phrasing will usually make more impact regardless of your subject. 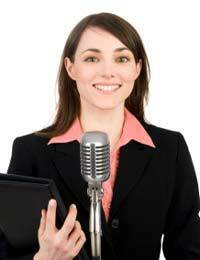 Most speeches have to be written to specific lengths - you will be usually be advised of this in advance. On average, you should write about six hundred words for every five minutes of speech. It's usually best to write a speech that runs slightly short of the allotted time, as it's better to finish early than to run over time. The exception is if you know the speaker always speaks quickly, or if you expect them to be nervous and therefore speaking more quickly than usual. The speed of a speech is also affected by its emphasis. A persuasive, emotive speech will generally be delivered more quickly than a contemplative or informational speech. Sometimes it's a good idea to leave a short pause after a particularly important point - you can mark this in the text, in square brackets with a clear line at either side. Avoid adding notes to speeches in a form where they might be read out by mistake. There are many different types of speech you may be called upon to write. In each case you should think primarily about your audience. Who are they? How educated are they, how much do they already understand about the subject of the speech, and how are they used to being addressed? If you have a mixed audience you can deliver important background information without being patronising by using introductory phrases like "Of course you will know that..."
It is always important for a speech to be delivered assertively and with confidence, but you should use a different style when writing for an audience of influential people, such as senior politicians, and an audience of people used to deferring to the speaker, such as junior employees. The former should be approached with respectful language and reminded, through your writing, why the subject is important to them. The latter should be encouraged to feel included with friendly language. Not everybody is used to listening to speeches. When writing for an audience that doesn't usually do this sort of thing, such as schoolchildren, emotive writing and humour are more important to facilitate engagement. Remember that a speech doesn't usually need to cover every aspect of its subject in detail. Its function is as a primer, to get people interested and make them care enough to look up more information later. Opening a speech is relatively easy. Make sure you are using the correct terms of address for the audience. Make a bold or humorous statement in the first couple of sentences to get their attention, then go on to substantiate or explain it in your first paragraph. Ending a speech well is what matters most - this is what the audience will really remember. Your final paragraph should build up to two or three punchy sentences. Repetition - of phrases as well as ideas - is good at the end, and you should always aim to close on an active, positive note.